Sale host Leo McDonnell and auctioneer Lynn Weishaar. James Schmidt, Menoken, N.D., McDonnell Angus bull buyer. 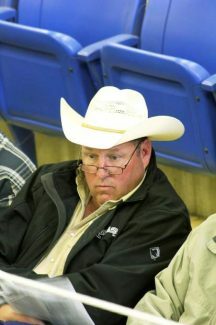 Vic Hanson, 6 Creeks Farm, Ekalaka, Mont., at the McDonnell Angus sale. 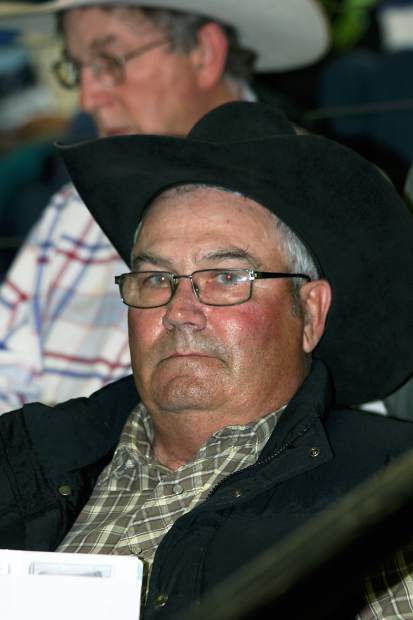 Mike Maher, Isabel, S.D., purchased McDonnell Angus Beef Country Genetics Bulls. 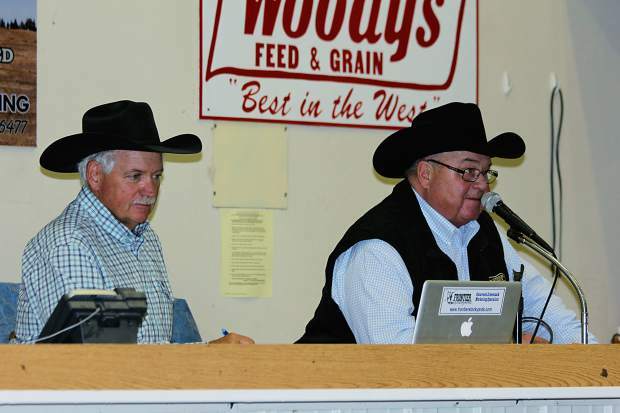 Leo and Sam McDonnell held their annual Beef Country Genetics sale at the Bowman Auction Market on May 6. McDonnell Angus has and extensive ET program. 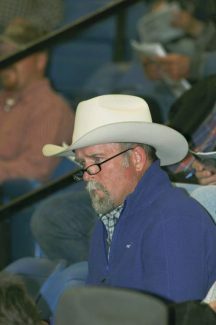 Of the 82 bulls in the catalog, over 50 were ET born calves. This gives the buyers a large selection of full brother genetics to select and purchase from. The bulls had all been run thru the Feed Efficiency lots at Midland Bull Test and were in great sale condition. The majority of these sale bulls were born at the Rhame, N.D., ranch. The McDonnell program focuses on efficiency, fertility, structure, efficiency, and maternal background. This set of bulls read well on paper, but also had the eye appeal, structural correctness and performance to back it up. Topping the sale was lot 30, McD SF Con In Focus 4520, a Mar. 2014 son of Connealy In Focus 4925 with epds of CED -2 BW 205 WW 67 YW 110 Milk 29 $B 113.57. Frazer Angus and Hay Cow Angus, Lincoln, CA partnered up to purchase the bull at $9,500. Six- Ess Ranch, LLC, Ekalaka, Mont., purchased lot 5, SL Uno 409, a Feb. 2014 son of CCA Uno 049 with epds of CED -2 BW 3.4 WW 56 YW 98 Milk 24 for $8,750. Lot 37, McD SF Waylon 4550, a Mar. 2014 son of Baldridge Waylon W34 sold to Nissen Angus, Chinook, Mont., for $8,500. This bull has epds of CED 3 BW 2.2 WW 62 YW 109 Milk 20 $B 130.18. Lot 14, McD Performer 4111, a Feb. 2014 son of CCA Uno 049 with epds of CED 5 BW 1.9 WW 62 YW 105 Milk 31 $B 103.28 sold to Sodak Angus, Reva, S.D., for $8,500. Sodak Angus also purchased lot 10, another Feb. 2014 son of CCA Uno 049 at $8,250. This bull has epds of CED 8 BW 1.8 WW 51 YW 88 Milk 27.